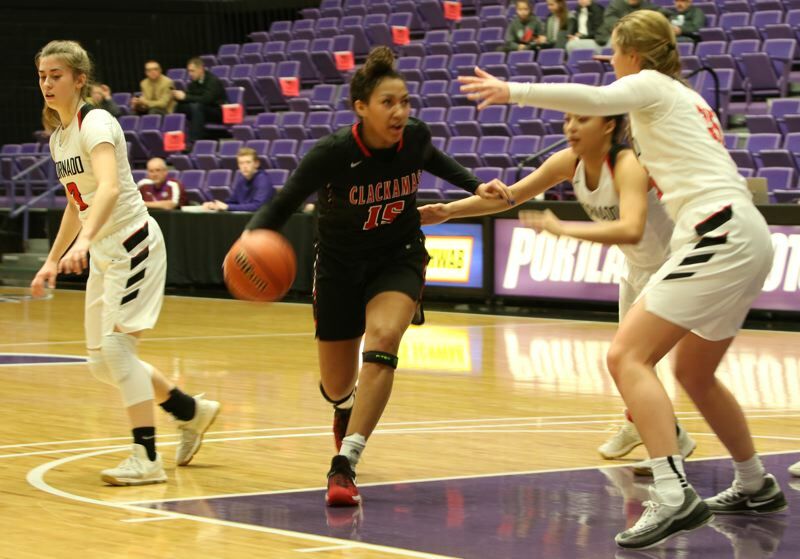 Clackamas girls' basketball team has another game to play after Bri Phiakahmngon scored six of her game-high 12 points in the final 1:21 to help seal the Cavaliers' 43-37 victory over North Medford in Thursday morning's consolation round of the OSAA Class 6A tournament at the Chiles Center. Kalani Hayes added 10 points, seven rebounds, and four assists, and Ciara James had 10 points and five rebounds as the No. 9 Cavaliers (24-3) advanced to Saturday's 9 a.m. fourth-place game against No. 2 Tigard. "We didn't want that to be our last game for our seniors and as a team," said Hayes, the Cavaliers' junior. "We really want to end on a win." Clackamas, bouncing back from Wednesday's 57-42 loss to top-ranked Southridge, also is assured of going home with a piece of hardware. The only question now: Will it be a fourth-place trophy or a sixth-place trophy? "We're excited about that," Cavaliers coach Korey Landolt said. "We get one more game to plan for, one more film to watch, and we've put ourselves in position to finish on a positive note." The Cavaliers got the job done Thursday with defense, using essentially the same defensive set they used against Southridge and concentrating their efforts on North Medford's Rylee Karrick and Megan Fossen. Clackamas closed the first quarter on an 8-0 run when North Medford came away empty on its final seven possessions of the quarter, and then the Cavaliers closed the second quarter with an 11-0 to take a 25-13 lead when the Black Tornado again went scoreless on the final seven possessions of the half. "We knew we could win this game with defense and we stuck to what we knew and executed," said James, the Cavs' 6-3 senior post. "Just because we had a lead, we still had to play hard, because could North Medford could come back." After James gave the Cavaliers their largest lead at 32-17 on a basket with 3:34 to play in the third quarter, North Medford mounted a comeback. The Black Tornado closed the third quarter on a 7-2 run to cut the lead to 10, then opened the fourth on a 9-2 run, cutting Clackamas' lead to 35-33 on Adriane McLemore's lay-in with 2:56 to play. "I knew it was one of those things where North Medford was going to start to rush us a little bit," Landolt said. "That's a trap that some teams have set and we've fallen into multiple times this year. "Just trying to execute with that pressure, knowing what they were trying to do to us, we had a lead that dwindled down quickly and that was a little bit scary, but my girls were tough and they withstood it." Clackamas' lead was 37-35 when Phiakahmngon, the senior point guard, made one of the biggest plays of the game as she drove the right side of the lane, scored as she was being fouled, and then made the free throw to give the Cavs a 40-35 lead with 1:21 remaining. Three more Phiakahmngon free throws in the final 45 seconds helped seal the decision. "Defensively, we were very locked in and focused," Landolt said. "Offensively, we hit some shots early that kind of helped and then we had a little drought when we looked a little unsure in the fourth quarter, but we were able to pull it together and walk out of here with a win." Elly Bankofier finished with seven points for the Cavaliers, who shot 52.2 percent (12 for 23) from the field and 50 percent (5 for 10) from 3-0oint range. Clackamas also had a 22-14 advantage in rebounds but committed 16 turnovers to North Medford's 10. "We just came back from Wednesday's loss and said, 'We've got to bring it,'" said James, who also had five rebounds, an assist, and three blocked shots. "We did that, we played as a team, and that's what helped us win."